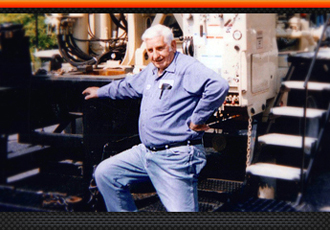 Noah Horn Well Drilling began in the 1950’s as a well drilling and pump installation business with churn type drills. We began as many businesses did in those days, with an office in our home. Almost all of our business was conducted face to face. If you wanted a well drilled, you went to Noah and asked him to do it. The first telephones in our area were party lines (lines that were shared by many people in a given area) and many people did not have telephones at all. The first office built to house the growing company was an old two-story building which was our home until 2007. Noah and Edith Horn built the building and lived upstairs – the office was downstairs in what became known as the “old drillers” side. The larger part of the downstairs was rented to a retail business and did not become part of the main office until the seventies. By this time, Noah Horn Well Drilling, Inc. began to grow along with the coal industry, drills became rotary drills. Jeffery Horn and Jerry Horn left the drilling company and started doing the pump work as a separate company, Horn’s Pump Service, Inc. This company would soon be repurchased by Noah Horn Well Drilling, Inc. Horn’s Pump Service, Inc. lay dormant until 1986. 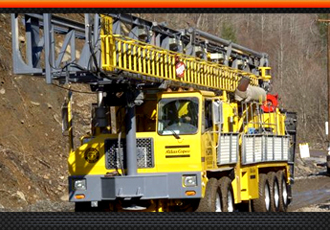 At that time it became an equipment rental company for Noah Horn Well Drilling, Inc. The methane gas which had been vented to provide a safer environment for the underground miners could be contained and sold. Suddenly, our area was full of companies ready to drill methane gas wells and construct pipe lines to distribute the gas to markets in West Virginia and Virginia. Noah Horn Well Drilling, Inc. doubled in size during this time. A new division was created, the trucking division. Before, a driller had a tank on their service truck which carried enough water and fuel to drill the well. Now, there were tanks located on well sites which were used for drilling and cementing these new methane wells. Truckers were needed to carry water from drip pots and compressor stations so that the methane could flow freely through the pipe line system. There was a division for the well service trucks (swabbing and fracking) and a division for site and road building. In the late 90’s the gas markets began to slow down. Drillers became truckers as Noah Horn Well Drilling, Inc. sought to hold on to their qualified employees. The Company returned to their roots within the coal mining industry. Although Buchanan County had lost many coal mines, Kentucky, West Virginia, and other areas of Virginia were mining coal and needed holes for belt lines, power poles and water wells. Slowly the company re-established themselves with their old customers and again the company grew. Then, just as suddenly as the methane drilling business slowed, it was reborn!